3 Bedroom cottage on 2nd Row set in one acre of garden with swimming pool. 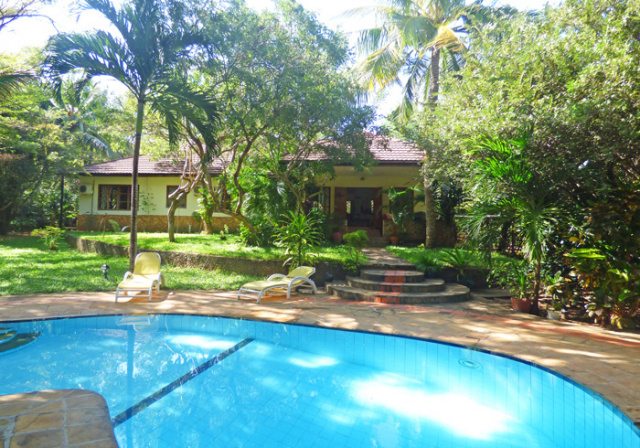 Family friendly house in one acre of land on Beach Access road, approximately 100m easy walk from Watamu Marine Park. 2 Bedroom Guest Cottage on Beachplot with pool. Can be taken with neighbouring 'Little Gem' as a 4 Bedroom option. 3 Bedroom Penthouse Apartment set over 2 Floors in Blue Bay Cove, Watamu. 2 Bedroom house with large swimming pool overlooking the mouth of Mida Creek. An additional room detatched from the main house may be taken in conjunction. 3 Bedroom Beach Cottage close to Ocean Sports and the fishing fleet. A luxurious 4 bedroom Moroccan style villa set in 2 acres of tropical gardens in the Mida Forest area with large swimming pool. Spectacular 5 Bedroom Private house overlooking Mida Creek. Lovely modern feel house with large pool only 10 minutes walk to Turtle Bay Beach. 4 Bedroom House, sister to The Boardwalk, in Mida with pool. 2 Bedroom Beach Cottage with Shared pool - sister to Bijou Cottage. 6 Bedroom natural, open house with private beach access. 2 Bedroom Cottage with shared pool on a beach Plot. Sister to Little Gem and Bijou Cottages.